"Dog pancreatitis symptoms occur when a dog's pancreas becomes inflamed. The disease is considered to be idiopathic, which means that the exact trigger or cause is unknown. 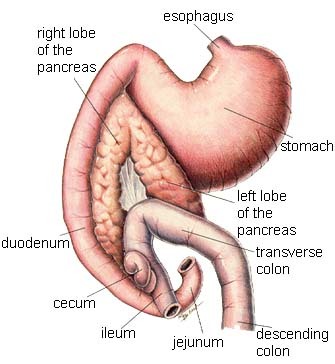 Problems with the pancreas lead to issues in blood glucose (sugar) levels and issues with nearby organs. Symptoms associated with mild cases of canine pancreatitis include anorexia (not eating), abdominal pain and lethargy. Symptoms that appear in some cases include vomiting with diarrhea and weakness. Chronic or more severe forms of the disease can include anorexia, abdominal pain, vomiting, diarrhea, lethargy and generalized signs of illness (affecting the whole body) such as fever.Dogs will look severely dehydrated, emaciated and in a hunched up position. Along with specific treatments, fluid therapy, supplementation and dietary management can effectively treat dog pancreatitis symptoms. Though the prognosis in severe cases is not good, a symptomatic approach to treatment in more mild cases can help a patient." In mild cases of dog pancreatitis, partial anorexia is usually an initial symptom; which is a reaction to reduced levels of pancreatic juices and secretions. Anorexia, vomiting, abdominal pain, diarrhea, lethargy and progressive weakness are some general signs of dog pancreatitis. It should be noted that symptoms might get worse and more severe, as the body reacts to more acute (rapid onset) and severe inflammatory responses in the pancreas. General dog pancreatitis symptoms may vary, depending upon the cause of the condition. Abdominal pain is common in those dogs in which the pancreatitis is a result of injury, trauma or mishandling of the pancreas during surgery. Similarly, dogs that have elevated pancreatic enzyme levels in their blood develop problems in the liver as well, represented by jaundice (increased levels of liver bile in the blood) or hepatitis (inflammation of the liver). Dog pancreatitis can be graded based on a review of acute or severe signs and symptoms. Similarly, in most cases, the prognosis can also by calculated based on the symptoms. Laboratory results are the main indicator for forming a prognosis (likelihood of a cure or positive outcome to treatment). Almost all cases of dog pancreatitis, whether mild or severe, have some common signs, as discussed above, but some severe cases may be represented by some other signs too. These are either increased severity in existing symptoms, or the presence of new symptoms. In the initial stages of the disease, anorexia, vomiting and diarrhea are the three main dog pancreatitis symptoms, which can worsen as the disease progresses. Dehydration is mainly caused by vomiting, thus dehydration is the result of other existing symptoms. Additionally, in severe cases the stool appears yellow and greasy. The dog may be ataxic (failure of muscular system), appear stressed and in a hunched up position. Abdominal pain, on the other hand, gets worse, representing the involvement of adjoining organs (nearby). Initially abdominal pain occurs, due to an inflammatory response, but as the disease progresses, pancreatic juices spread to adjacent organs, causing irreversible injury and damage, resulting in severe abdominal pain. In any case, it is can be said that dog pancreatitis symptoms can indicate the degree of disease present; which helps in diagnosing and defining possible outcomes of the disease, i.e. prognosis. Along with specific treatments for the underlying causes, pancreatitis symptoms in dogs should be preferably treated individually. Fluid therapies and the administering of nutrients through the intravenous route will help in rehydrating and treating anorexia. Fluid therapy is considered the base of the treatment plan, as it helps in treating different symptoms, such as anorexia, dehydration, lethargy and weakness. The dog, once rehydrated, is able to eat small meals comprised of soft food which contain more carbohydrates and less fat. In addition to the base treatment plan recommended by a veterinarian, a homeopathic supplement can be used for added support. Products like Pancreas Booster contain natural ingredients known to boost the function of the pancreas, such as Bromelain (extract of the pineapple which helps digestion), Papain (enzyme from the papya) and Gymnema (regulates sugar levels in the blood). Mild cases of canine pancreatitis have a good prognosis. This is not the case for more chronic forms of the disease. Diagnosing the disease early is important before any complications can set in.